Scale Matters: But, What about Time? If you haven’t checked out Monday’s, Tuesday’s, and Wednesday’s blog posts, it’d be best to start there! This week we’re having a series of posts discussing scale and size. I’m hoping you all still have your imagination hats handy. Size, both great and small, and the ability to perceive it through a series of magnificent inventions are already wondrous enough to contemplate. However, by adding one more aspect to this thought process, we can really understand the importance of scale. We generally think of time in seconds, minutes, hours, and days. If longer stretches are required we have years, decades, and millennia. For those of us on Earth, time is linked to the path of our plant around the sun. A day is the length of time for one rotation of the Earth. 24 hours. A year is one Earth orbit around the sun. 8765.81277 hours. But each planetary body has it’s own duration for days and year. On Mars, each day lasts on average 24 hours 37 minutes and 22.663 seconds. Researchers and technicians working with robotic rovers and landers on the red planet must adjust their lives to Mars time. Imagine a whole team waking up about 40 minutes later each day so they can maximize research conducted during the daylight hours on a distant planet. The human concept of time is inherently quite stunted. We have about 80 year to observe, learn, and live. We use time to schedule our lives, educations, and aspirations. We have time allotted for school, work, and play. Holidays are assigned a certain date on our calendar. Sometimes it can feel like a very local concept. But time spreads out over the universe, just like space. All of human history is but a blip in time. If we take the 14 billion years that have occurred since the Big Bang and realign it into a single year, then all of recorded human history has happened in the last 13 seconds. With our universe, time and distances are very closely aligned. Remember that our universe started as a single point from which everything erupted. Time and space included. And with time, the universe expands, thus more space. The building blocks of everything that exists now were created in the seconds following the Big Bang. Everything that composes our body, planet, solar system, galaxy, etc. 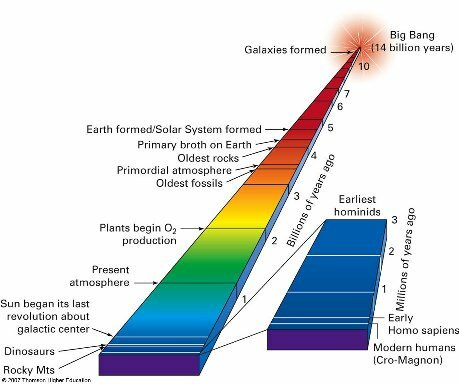 At first, the universe was mainly comprised of basic elements. Hydrogen, the simplest of all elements was most abundant. One proton, one neutron. As time continued protons began to stick together an eventually Helium. Two protons and neutrons. Allow enough time and more and more elements arise, increasing in complexity. So we’ve connected time to it’s importance in our own lives, and to the lifespan, size, and complexity of the entire universe. We may also use time as a form of distance! The speed of light in a vacuum is a universal constant valued at 299,792,458 meters per second. You can see this in action by just going out at night and taking in the night sky. Light from stars and reflected from planets is barreling across space to your eyes. The light has traveled hundreds or thousands of light-years to reach you, granting you a glimpse into the past. My artist friend, Danielle, calls it our Museum of Light that serves as a window to our past. Keep in mind that your eyes are the first things these photons have bumped into since they left the surface of a star. Also, that the star you make a wish upon tonight might not exist at this point in time! Remember the Hubble’s Deep Field Image from yesterday’s post? Those galaxies are some of the oldest we’ve observed, but we can still collect the light that has been traveling towards us to create an inspiring photo. The following video brings together several concepts from this week’s series on scale. As the intro states, this film shoes the known universe as mapped through astronomical observation. Every celestial body is represented to scale and in its correct location. Keep an eye on the lower portion of the video that keeps track of light years traveled. We’re nearing the end of this week’s series of posts. I hope to bring everything together tomorrow in the final post. I’d appreciate some feed back on the pace and quality of recent posts. Have you enjoyed and learned from these posts? Do you like the idea of a series of posts spanning a week? Do you have a topic in mind that you’d like to know more about? I really liked this week's series of posts. I think they did a great job of putting science ideas together (both those that we can use in space and here at home). I don't think you should be afraid of having longer series that were interspersed with other types of posts…not that I know what those would be… I guess I was thinking of more when you are blogging from the mission, you would probably want to have some posts thrown in about how things are going in the astronauts day to day. Just thoughts. My favorite thing about this series was how well you tied in all the aspects of scale, especially time. I think that lots of people (esp. lay people who aren't in the sciences) don't think of this as an aspect of scale. Great job! I'm very excited about some potential 'life on Mars' posts! Also, updates on different research projects, informative videos, and maybe even some sillier topics. 4 months is a long time to think about different posts, but hopefully we'd also get back LOTS of feedback from compassionate followers.